Starters ordered will be shipped the next business day by USPS Priority Mail or UPS. Large orders may qualify for a discount and may not qualify for next day shipment. If you do not know what lamp you require or for lamps not listed, email your request or call 336-882-2854. To order, please use our secure shopping cart above or call 336-882-2852 or 800-692-3051. Click to go to our Home Page, View Cart and to find Shipping Information. 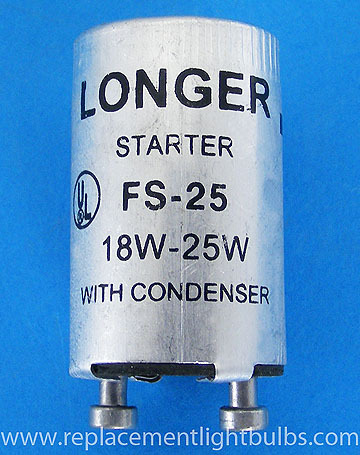 FS-25 Aluminum Fluorescent Starter For 18 to 25 Watt Fluorescent Lamps. For use with FC12T9 Circline Lamps when Operated by Preheat Ballasts. For use with F22T8 Preheat Lamps. For use with F25T12 and F18T8 Preheat Lamps.